Photo 1: Cleanroom in the Kedrion Biopharma facility contains two in-line conditioning systems with chromatography functionality. Preparation and storage of buffers is a challenge for biopharmaceutical companies developing protein-based pharmaceuticals. 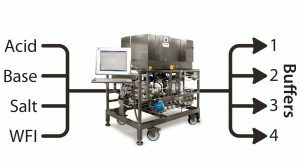 The need for volumes of buffer to purify increasing upstream titers have become a major bottleneck in biopharmaceutical downstream processing. Italian biopharmaceutical company Kedrion Biopharma collects and fractionates blood plasma to produce plasma-derived therapeutic products for treating and preventing serious diseases, disorders, and conditions such as hemophilia and immune-system deficiencies. To expand its offerings and include the immunoglobulin G fractionate of blood plasma (IgG, an antibody responsible for protecting against multiple bacteria and viruses), the company began construction of a new facility in Tuscany. Manufacturing steps in plasma fractionation rely heavily on buffers. So when planning this new facility, Kedrion Biopharma wanted to use advanced buffer-management techniques to optimize buffer formulation, improve process economy through automation, and maximize use of the facility footprint. The company routinely uses 26 different buffers to meet the needs of both chromatography and ultrafiltration in manufacturing IgG alone, producing 200,000 L of buffer every three weeks. Taking a traditional approach to buffer preparation would have required dedicating a significant amount of the new facility’s space to large stainless steel hold-up tanks for storing the ~70,000 L of buffer required for production of a single batch. Floor space is a valuable commodity, and for manufacturers needing to expand, the installation of additional tanks to support increasing production volume often is not an option. 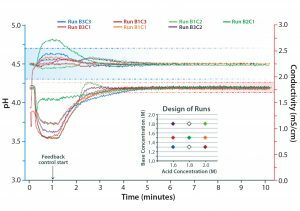 Concerned that floor-space requirements associated with traditional buffer production would limit production capacity at the facility, Kedrion Biopharma investigated a new solution known as in-line conditioning (IC). Figure 1: With the in-line–dilution method of buffer preparation, one stock solution of concentrated buffer (typically up to 10× concentrated) is diluted when needed to produce a standard buffer in the final volume, reducing the need to store large volumes of premade buffers. 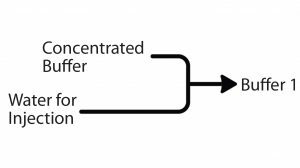 An extension of the concept of in-line dilution (ILD) (Figure 1), IC is a buffer-management strategy that allows a biomanufacturer to produce buffers on demand by limiting the need to formulate complex concentrated stock solutions in house. An IC system uses single-component stock solutions of individual buffer components to produce different buffers. The system combines required amounts of each component to specification according to carefully created and extensively tested recipes, enabling an exact amount of buffer to be produced when it is needed. Whereas ILD also reduces the amount of buffer and tank volume needed from that of traditional buffer preparation, it does not reduce the number of tanks required. And to correct pH and conductivity of diluted buffers, complex final adjustments to buffer concentrates also can be required with ILD. With IC, however, buffers of different concentration, pH, or conductivity can be produced from the same pair of corresponding acid and base stock solutions. 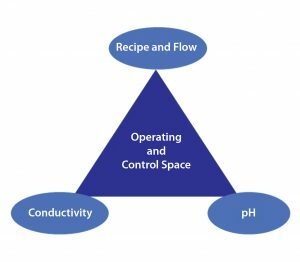 This approach eliminates the need for conductivity and pH postadjustments while adding the flexibility of on-demand production of different buffer formulations from the same stock solutions. By thus simplifying buffer production, IC can help companies address make their manufacturing facilities more responsive and flexible to market demands. To determine where space savings and improvements in efficiency could be made, Kedrion Biopharma approached GE Healthcare for a full assessment of its buffer production requirements. Using the customer’s list of required buffers, GE analyzed all the different steps to ascertain whether it would be possible to prepare all those buffers from a small number of corresponding acid and base components. Over a six-month period, the supplier analyzed that range of buffers required to determine whether and how they could a reduced number of stock solutions could provide them. Ongoing discussions between the companies during that assessment period guided the system design, how it should be split into systems, and how the set-up would be integrated into the facility design. After reviewing all aspects of the manufacturing process where IC could have an impact, the team determined how it should be implemented. This collaborative process allowed the full benefits of IC to be realized in the design of the final facility. In biopharmaceutical production, buffers of acetate, phosphate, citrate, or tris(hydroxymethyl)aminomethane are common in different manufacturing steps at different concentrations, pH levels, and/or conductivities. 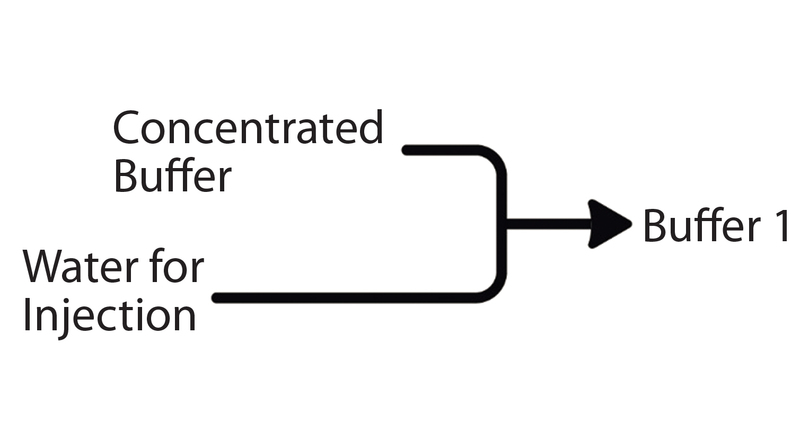 Whereas ILD involves dilution of concentrated prepared buffer formulations, IC simplifies buffer production to the individual components, which are separated and concentrated (Figure 2). Combining specific amounts of a corresponding acid and base, water and salt can produce a number of buffers from the same buffer system with a wide range of properties. Figure 3: Production of buffers from acetate shows how in-line conditioning can offer economies of scale when used to produce a range of buffers within the same buffer system. In this case, the biomanufacturer required four different formulations of acetate buffers throughout its IgG process. With two highly concentrated solutions of corresponding acid and base (HAc and NaAc) components connected to the IC system, it was possible to produce those four different formulations on demand at the point of need. Figure 3 illustrates how IC thus offers economies of scale. To produce the full range of 26 buffers needed for this specific plasma-protein purification processes, GE determined that Kedrion Biopharma needed just 11 individual-component stock solutions. Those were incorporated into the design of an IC solution to suit the particular processes and available storage space, thus improving on efficiency and economy. The companies also worked together to change the facility design to incorporate IC into the overall manufacturing process. The agreed set-up included four dedicated IC skids, two with integrated chromatography functionality (Photo 1) and two for use as central preparation stations (one of which would be connected to the filtration skid). In the final stage of the design process, we finalized specific details to enable the most effective installation of these systems, which included identifying the right inlet heights and direction of outlets, and so on. As part of process stream design and integration, a number of buffer recipes were developed. To provide proof of principle, GE confirmed a subset of theoretically calculated buffer compositions through laboratory experiments. During the factory acceptance testing of the IC equipment, all 26 buffers were evaluated experimentally and challenged, and all fell within specifications. This evaluation process included all necessary buffer recipes required for use in the final IgG purification methods. IC uses sophisticated operating mechanisms to produce buffers efficiently and economically while ensuring that results are consistently within the exact specifications needed. Multiple feedback loops act in concert to modify input-line flow rates. By producing the exact amount and formulation of buffer required, IC eliminates the need for final adjustments. And with separated buffer components, solution concentrations depend only on their own solubility. In multicomponent buffers overall concentration depends on the least soluble component — and where salts have the same ions, the common-ion effect will decrease solubility and lower the concentration factor of a buffer. The common-ion effect reduces solubility by a shift in solubility equilibrium when adding shared ions. Algorithms built into IC consider effects of ion activity, stock concentration, and final concentration to produce buffers at the precise strength and pH required. The system extensively monitors critical buffer parameters throughout this process so that in-line buffer variability can be compensated for through adjustment of relative volumes, thus ensuring quality control of the outputs. This feature was valuable for the IgG process because some buffers used were sensitive to conductivity, requiring that parameter to be kept constant. Using pH and conductivity feedback control, we could ensure that the critical quality attributes were maintained (Figure 4). Figure 5: In-line conditioning provides complete control-mode flexibility in buffer preparation. In addition, IC’s capability for dynamic control improves output flexibility when using a fixed set of stock solutions, with the capability of producing a broad range of buffers to a number of specifications (e.g., concentration, pH, and conductivity). Figure 5 outlines three possible control modes for this particular system. 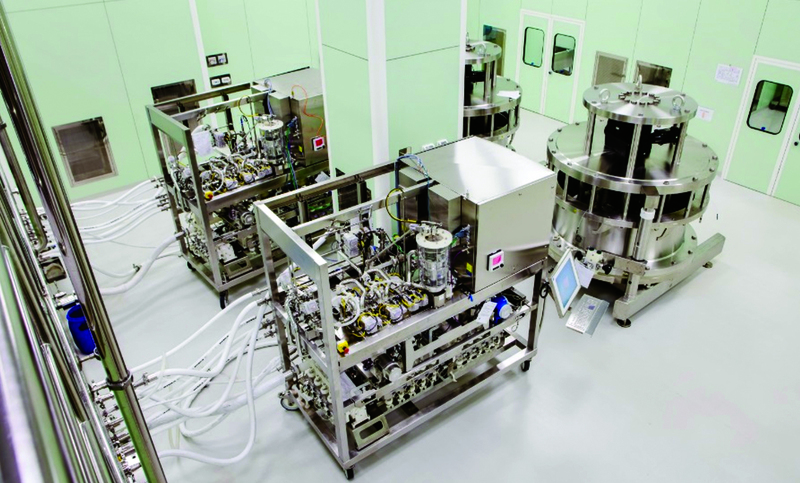 Running on GE’s UNICORN system-control software enabled the planning, controlling, and analyzing of each process run — automation of which was a key requirement for this biomanufacturer. 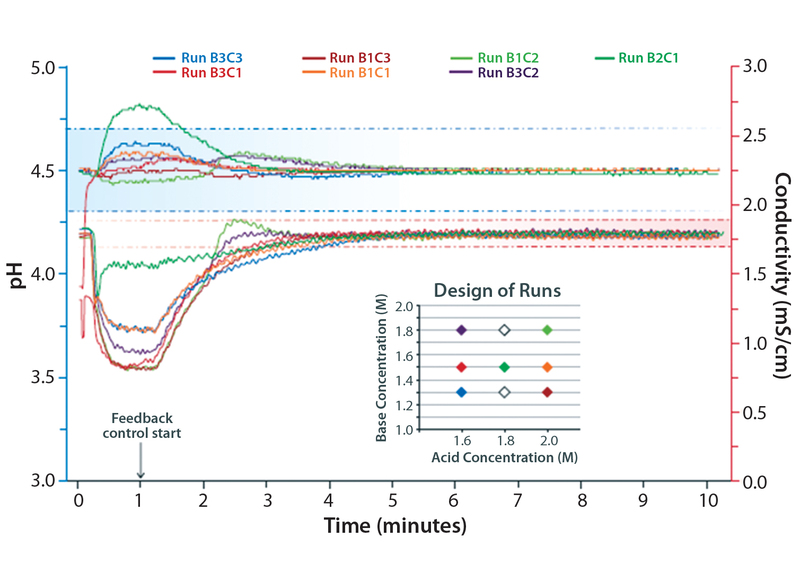 By automating buffer production at every stage, all buffer characteristics are recorded so operators can monitor the trending of those properties by looking at chromatography results (e.g., in Figure 4) and ensure that they don’t deviate. It was vital that the control software could be integrated with Kedrion Biopharma’s existing distributed control system (DCS), which is responsible for controlling process variables for all systems throughout the plant. To enable effective communication between the different workflow components, UNICORN and the DCS software were configured to communicate via Object Linking and Embedding for Process Control (OPC). The resulting set-up allowed for real-time data to be shared effectively, for run data to be stored within the planned automation system, and for appropriate start and stop signals to be properly sequenced. We also added a custom instructor system to further ensure efficient buffer preparation. Automating buffer production ensures that production records are more accurate than they would be with manual methods. Instead of the properties of a buffer being measured once (at the end of the process), the control system continuously measures all parameters for a run, providing for greater control of those parameters. Each buffer produced has an accompanying record of data evolution for flow, pH, conductivity, and so on. In addition, the system can adjust the flow of input lines in response to automated feedback mechanisms, ensuring that required buffer specifications are met. Because of the conductivity sensitivity of a number of its buffers, this level of control was a deciding factor for Kedrion Biopharma when considering IC. Figure 4 shows the robustness of IC in ensuring the final buffer properties. 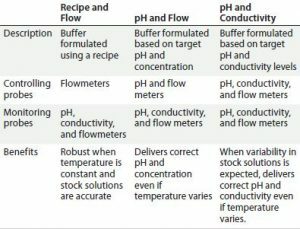 After desired final pH and conductivity were set, the system was challenged with three different concentrations of each individual component stock solution: three acidic solutions and three basic solutions of the same buffer system. The range of concentrations were mixed in different combinations for each run while applying the same UNICORN method. As the data reveal, all combinations resulted in the same buffer with the same critical quality attributes (pH and conductivity). That demonstrates a reliable output that does not depend on starting concentrations of the acid and base solutions. Using IC, Kedrion Biopharma could replace production and storage of 26 buffers with 11 stock solutions, lessening the corresponding number of storage tanks. Based on this strategy, fewer containers were needed for those stock solutions, and the containers also were smaller in size. 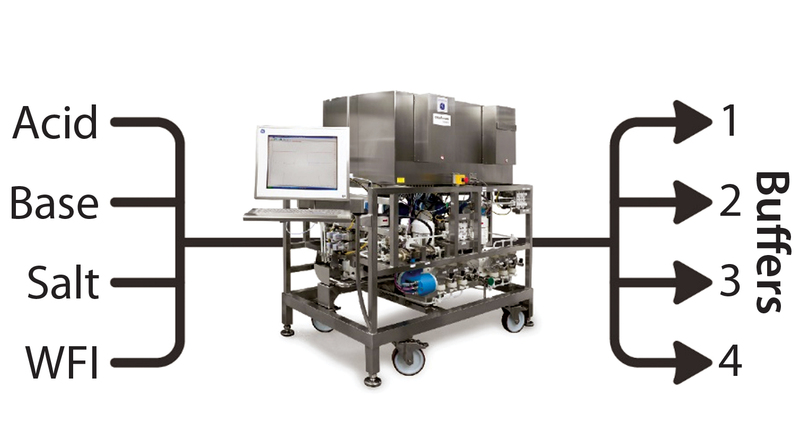 Integrating IC systems into the process stream reduced facility footprint by 60%. Several factors contributed to that overall space savings; however, this reduction is largely attributed to smaller volumes of solutions that need to be stored and processed. 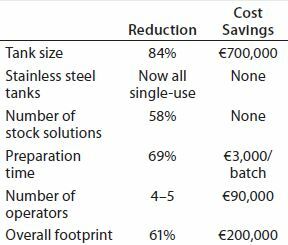 Table 1 summarizes our space-saving and operational-efficiency improvements. IC demands only 16% of the normal tank size required to prepare and store buffers. The resulting sevenfold reduction in buffer-storage volumes was key in facilitating the biomanufacturer’s move to entirely single-use buffer tanks in the new facility. This had the additional advantage of eliminating our need for labor-intensive, time-consuming in-situ cleaning and corresponding validation efforts. Using the four installed IC systems, Kedrion Biopharma could produce buffers at flow rates of up to 6,000 L/h. Manual intervention and support were reduced significantly through automation and decreased requirements for handling the smaller volumes of stock solution. Overall, IC’s flexibility and predictability contributes significantly to improvements in productivity compared with that of traditional buffer-preparation approaches. Through automation and reduction in buffer volumes from incorporating IC into its new facility, Kedrion Biopharma could use resources such as space, manual labor, time, and investment more efficiently. When a process requires the same buffer system with different properties, IC can provide economies of scale and support a corresponding reduced facility footprint. Buffer can be produced in-house and on demand, providing for greater control and flexibility overall. Automation enabled the process to be converted from one that is operator intensive to one that is process intensive. Valuable floor area could be dedicated to production instead of support services, with an overall decrease in footprint (m2) required for buffer production. Reducing the volumes of buffer needing to be stored and processed also supported a full conversion of this unit operation to single-use technologies, further enabling rapid response times and production flexibility. On completion of this transition to IC, operational efficiency has improved and processes are more robust. IC has contributed to a more flexible and responsive facility that can adapt to meet increasing market demands. Dr. Davide Fabbrini is biological product manager, and Ing. Carlo Simonini is engineering manager at Kedrion Biopharma. Joakim Lundkvist is bioprocess modality manager, Enrique Carredano is application specialist, and corresponding author Debora Otero is global product manager for CBS bioprocess at GE Healthcare Life Sciences AB, Björkgatan 30, 751 25 Uppsala, Sweden; 46-18-612-1278; debora.otero@ge.com.